Lesson Plan for years 5 & 6 created by the National Literacy Trust for World Book Day resources on the topic of UNLIKELY HEROES. Download M. G. Leonard's poem The Billion Bug Road to read in class. Listen to her read it, and then write your own mini-beast poems. If you would like a free Beetle Boy poster, featuring illustration by Julia Sarda, (see below) for your classroom or library, then please contact Sam. Only available whilst stock lasts. Beetle Boy poster featuring illustration by Julia Sarda. Dr Sarah Beynon is my scientific advisor. She reads my books and tells me if I get any beetle facts wrong. She runs The Bug Farm in Pembrokeshire. It's awesome. They do great educational work, and are fun to visit if you are on holiday in Wales. They have a great restaurant, The Grub Kitchen, where, if you are brave, there are a couple of buggy items on the menu. Make a Beetle Hotel with M. G. Leonard with this Blue Peter video. 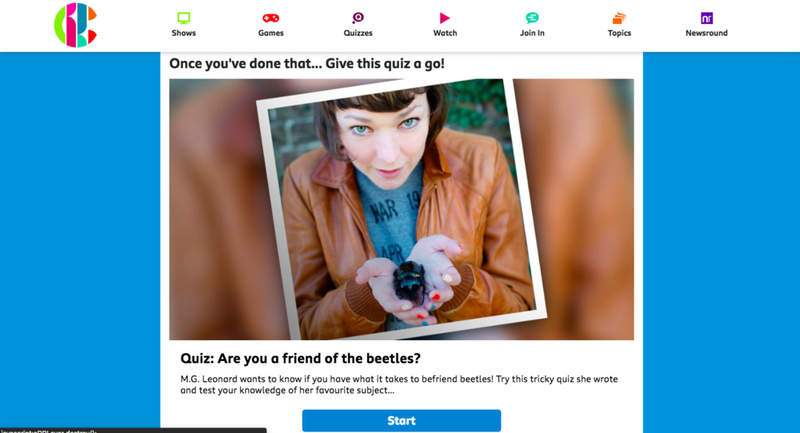 Take one of these quizzes to see how well you know your beetles. Multiple choice quiz for Blue Peter. True or False quiz for Blue Peter. If you turn to the back of Beetle Boy, you'll see that I have been working with the People's Trust For Endangered Species, to help promote the Great Stag Hunt, which records UK sightings of the endangered and beautiful Stag Beetle. They have some great learning resources. CLICK to learn how to befriend a beetle.